The first 555 timers, the NE555V/SE555T from Signetics, were produced more than 47 years ago. Designed by Hans Camenzind, this part eventually sold over a billion units per year, and has been used in everything from children’s toys to spacecraft; the original bipolar-technology 555 didn’t need radiation hardening, only very rigorous testing, for space qualification. Hans sadly passed away in 2012, but you can hear some audio clips of him discussing the 555 at the Transistor Museum site. In that interview, he relates how Signetics chose not to patent the design. At that time, Silicon Valley enjoyed a culture of mutually assured destruction with respect to intellectual property: companies freely stole ideas from each other, secure in the knowledge that the first to file a patent suit would be hit with an overwhelming response to all of their own infringements. This environment allowed versions of the 555 to be sourced by multiple vendors, keeping prices low and increasing the part’s appeal to designers. The Art of Electronics called the 555 a kit of parts, and that’s probably the best overall description you can come up with. Inside, you’ll find a voltage divider producing references at 1/3 and 2/3 of the supply voltage. One of two comparators fires when the voltage on the TRIGger pin is less than the lower reference or that on the THREShold pin is greater than the upper one. The outputs of the comparators lead into a digital latch, which can also be reset with an external active-low signal. Finally, the output from the latch drives the OUTput and DISCHarge pins, the latter typically being used to discharge an external capacitor during the high part of the output cycle. What can you do with these parts? Perhaps the most common use is as an astable multivibrator or RC relaxation oscillator. In this role, an external resistor and capacitor set the time constant for oscillation. Although the original bipolar design had difficulty generating output pulses down to 50% duty cycle, the CMOS variants can handle this by using a single resistor from the output back to the capacitor. While you can make a similar relaxation oscillator from nothing more than a Schmitt-trigger (ST) inverter, the resulting frequency accuracy will be poor, since the hysteresis level on ST inputs is not very well controlled: the timing will vary from part-to-part. By using the voltage divider and window comparator structure of the 555, you get better frequency accuracy and stability, as well as a lot of design flexibility. The 555 isn’t just an oscillator, though. It can also be used in monostable (one-shot) mode, producing a fixed output pulse width in response to a low-going signal on the TRIGger input. In this mode, applying a voltage to the CONTrol pin allows you to modulate the output pulse width. I’m surprised how often this is used: in just the past week, I’ve heard from two people who’ve found 555s used for PWM dimming of LEDs in commercial products. Beyond the basics, the 555 can be used for timing sequence generators, pulse position modulation, time delays, ramp generators with the addition of a current source, and a multitude of other applications. Just because it’s so often used does not mean that the 555 is universally loved. An EDN column from 2011 shares some hard-earned lessons in 555 failures and the fact that an analog legend, Bob Pease, was not at all a fan of the part. Still, it’s cheap, easy to use, and good enough for many, many applications. So, once we’ve decided to go with a 555-type circuit, it’s time to have a look around and see what’s available in 2019. While you can still buy the original-recipe bipolar 555 with its 100 kHz frequency limit from several vendors, the new CMOS versions seem to be where the action is. I took a look at two such offerings. TI’s LMC555 claims to be the smallest and fastest fully-featured 555 available. This is a CMOS variant, with a maximum frequency of 3 MHz according to the datasheet. It’s available in a variety of 8-pin packages, including DIP, SOIC, and VSSSOP, in order of decreasing size. 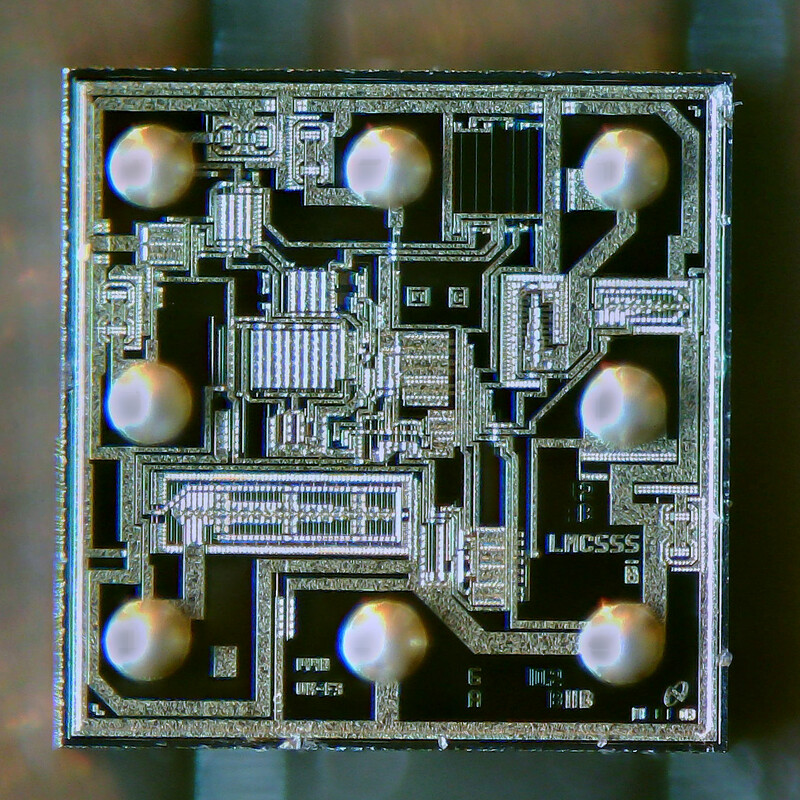 Also available is the hobbyist’s worst nightmare: a 555 in a chip-sized BGA (ball-grid-array) package. This part is smaller than two 0603 resistors side-by-side. While dead-bugging the DSBGA version would be quite a feat, the existence of such a small package raises a few interesting questions. Where are 555’s this small being used now, and what hacker uses would benefit from this level of miniaturization? Microchip offers its own version of the 555 concept with the MIC1555/57 timers, both in small but relatively hacker-friendly SOT23-5 packages. The price paid for the smaller footprint is the elimination of a few pins. The MIC1555, which can be used in the traditional oscillator or one-shot roles, is missing the CONTrol voltage input, DISCHarge, and RESET pins. One unfortunate consequence is that PWM applications are out. The MIC1557, on the other hand, combines TRIGger and THRESHold into a single “T/T” pin, and adds a chip select (CS) pin. This version isn’t suited for one-shot operation at all; it’s intended as an oscillator with shutdown (< 1 uA) capability instead. The datasheet lists a maximum 5 MHz astable frequency for either part, which at least on paper, is faster than the LMC555. Looking Microchip’s reduced-functionality timer offerings, I wondered what you could do if you built a 555-like circuit from other parts. The idea isn’t entirely new – a 555 built from discrete transistors took one of the prizes in the famed 555 Contest – but the possibilities are pretty intriguing. For my take on the concept, I went for raw speed, choosing a pair of fast ADCMP600 comparators and a latch made from a 74LVC2G02 dual NOR gate. 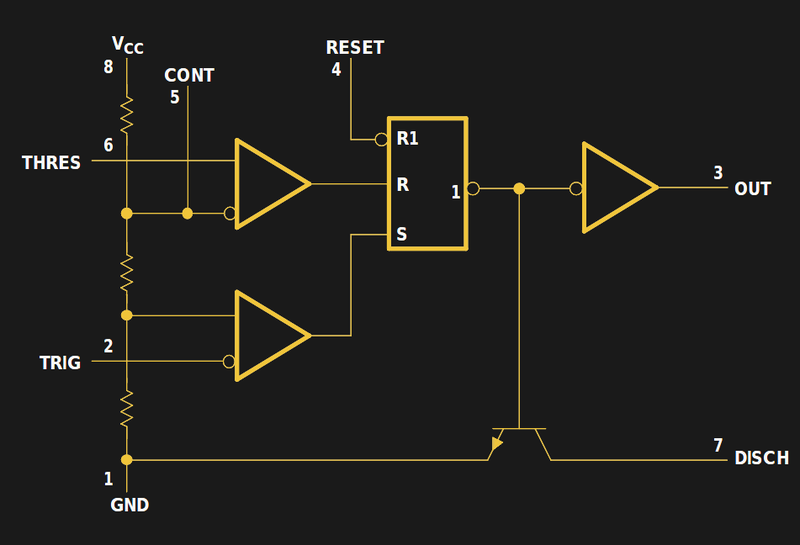 The comparators have a propagation delay of only 3.5 ns, with the NOR gates typically under 2 ns and offering some of the fastest edges I have measured on CMOS logic. Since the RS latch provides two outputs, you can choose either normal or inverted pulses. This also allows one to obtain an output (from the inverted port) without loading the feedback path. The resulting circuit, which I called the FF555 (see the full project on hackaday.io), was built on a postage-stamp-sized PCB with 50 mil square pads for external connections. I used through-hole resistors and capacitors as the timing components to ease testing. To measure accurate waveforms from the inverting output, I used a 10:1 resistive probe formed from a 1/8 W 453-ohm resistor and a length of RG174 cable. The probe feeds a 50-ohm terminated oscilloscope input. Testing in astable mode showed that the circuit was pretty robust: it will happily oscillate with no added RC at all. With the output connected directly to the threshold and trigger inputs, it oscillates at 90.5 MHz, this frequency determined mainly by the total propagation delay (~ 5.2 ns) plus some small R and C of the circuit itself. When used with typical RC values, it performs as expected, easily reaching VHF frequencies, with maybe 50 MHz a reasonable limit for repeatability without tweaking for individual spread between units. The output has crisp edges, with the inverting output measuring rise times less than 500 ps, and fall times around 800 ps. (Bipolar NE555’s are typically two orders of magnitude slower at 100 ns.) At these speeds, even short connections need to be treated as transmission lines and terminated correctly to prevent reflections. Although using an RC relaxation oscillator at tens of MHz is not a very practical thing to do, using this circuit for very short one-shot pulses or high-frequency PWM might prove interesting. This version also isn’t cost-effective at all: there’s nearly $10 worth of comparators on the board. Even so, I think the takeaway from this experiment is that the architecture of the 555 can easily translate into other circuits if you need something special, or just want to play around in analog-land for a change. Do these modern takes on the classic timer IC give you any ideas for new applications, or improvements to an existing 555 hack? Can you make a faster one? Let us know in the comments. On the other hand, if you’d like to read more about the 555, have a look at some of the 541 (so close!) articles we’ve run about it over the years. 74HC123? Depends on how “connected” to ground you need the output to be – you may need an external MOSFET to switch your load to ground for higher currents. Start with a 74LVC2G14 dual Schmitt inverter. Connect your input signal (a high pulse) to the input of one inverter, then connect a 10k resistor between that node and the second inverter’s input. Connect a 50pF capacitor between the second inverter’s input and GND. When the input is low, both outputs will be high. When you send the input high, the first inverter’s output will go low, and the second inverter’s output will go low about 500ns later. The width of the pulse is largely independent of the propagation delay through the inverters, since both inverters will have about the same amount of delay (<10ns for LVC logic). Connect a P-mosfet's source to the second inverter's output, and its gate to the first inverter's output. Connect a 10k resistor between the drain and GND. When the input is low and both outputs are high, the P-mosfet's Vgs is 0V, so the mosfet will be shut off. Its drain voltage will be 0V. 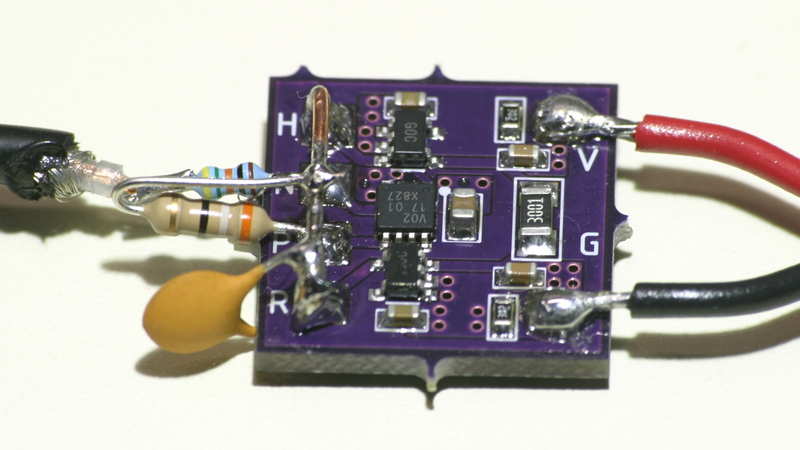 When the input goes high, the mosfet's gate voltage drops to 0V, turning it on and sending the drain voltage to VCC. 500ns later, the source voltage drops to 0V, pulling the drain voltage and Vgs to 0V again. By itself, that circuit doesn't retrigger. To add retriggering, put a 50pF cap in parallel with a 10k resistor between the first inverter's input and GND, then connect a diode between the input signal and the first inverter's input. When the input goes high, it will charge the new 50pF cap, holding the first inverter's input high for about 500ns. If the input drops low and goes high again, it will simply recharge the cap, providing retriggering. The limiting factor on pulse width is the P-mosfet's turn-on/off time. It will take about 1us for the second inverter's output to go high again after a pulse has ended, since the 50pF delay capacitor has to discharge through its own 10k and the 10k from the retriggering circuit. That’s a very informative comment. Thank you to explain it step by step. Analog is not used that much nowadays, and explaining it’s way of thinking is a nice thing. Thanks for your tips will have to give it an go! Wouldn’t this have a larger footprint, worse timing consistency and worse current consumption than the microprocessor solution while being the same price? As a student one of my favorite uses for the 555 was as a cheap stepper motor driver. Very old floppy drives used large NEMA23 steppers with a high voltage drive. Pushing 180mA at 12V was enough to control these steppers and within the reach of the NE555. Using 4 555s, this was the cheapest stepper drivers I ever built. I’m curious what the competition would be for this title. Define “success” however you want and make your case. If we can relax the “has to have a constant bit in the part number” I’d suggest the op amp might be in more designs and have shipped more parts? When I tried to generate a 1.3 MHz square wave with the LMC555, I got some low frequency amplitude modulation. I had better luck with the TLC555, which also costs half as much. I never heard about the MIC1555, but you just made me order a handful! It would be a bit harder to predict the timing. The 555’s timing is controlled by RC charge/discharge curves, which are exponential. When you charge a cap through a resistor, the voltage across the resistor drops to 1/e of its original value after one RC time constant (literall the value of the resistor times the value of the capacitor). 1/e=0.368, which is reasonably close to 1/3. If you start with 0V across a capacitor and connect it to a pull-up resistor to VCC, the cap will charge to 2/3 VCC in about one RC time constant. If you start with a cap charged to VCC and connect it to a pull-down resistor to GND, the cap voltage will fall to 1/3 VCC in about one RC time constant. If you continually charge a cap from 1/3 VCC to 2/3 VCC, then discharge it to 1/3 VCC again, the voltage across the resistor charging the cap changes by 50% either way. It takes about 0.7 RC time constants for that to happen, which makes calculating the frequency fairly easy. When the system focuses more on what you can stop other people doing, rather that than what you can do yourself, it is broken. Both also have internal counters, and some level of configuration. I could have done it with a 555!